Your private charter journey begins as you depart over the famous Las Vegas Strip on your flight to Monument Valley, Utah. During the flight you will fly over the West Rim of the Grand Canyon and then follow the shoreline of Lake Powell to Monument Valley. 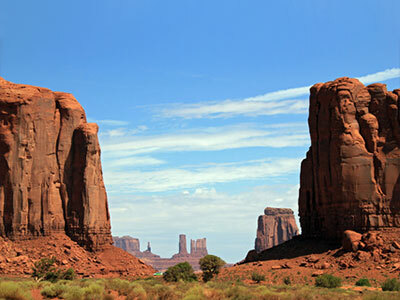 You will experience the scenery of Monument Valley Tribal Park. The towering pinnacles and buttes have been the backdrop for countless films including the classic John Wayne Westerns. The highlight of the day is an up-close tour of the valley on board your Maverick helicopter. You will fly over Rainbow Bridge National Monument. Rainbow Bridge is the world's largest known arch rock formation and a sacred place of the Navajo Nation. Rainbow Bridge rises out of the desert to a height of 290 feet and a span of 234 feet and is 42 feet thick and 33 feet wide at the top. You will see Antelope Valley and many different types of scenery and land formations. This is truly the enchanted land of the Navajo Nation. To get a quote or more information, please click the "REQUEST" button. You can also call us at 702-405-4300.